Does your child forget to bring home their homework? Do they speed through their homework? Produce sloppy homework? Or resist the work completely? Problems with homework can be very stressful to family life and in many cases, result in parent-child relationship break-down. The first thing you need to determine is whether there is a problem. If you and your child are tearing your hair out, yelling and screaming at each other over homework issues then it is an easy diagnosis. There is a difference between occasional problems and regular problems. We all have an off day now and then. Gentle reminders and prompts to do homework are also normal for most families. However, if the homework issue is pervasive, with regular excuses for homework not done and constant battles to get your child to complete homework then there obviously is a problem. However, in some instances, it may be a demanding parent expecting perfection. If there is even the slightest doubt in your mind, call your child’s teacher and get another perspective. If the teacher is noticing similar behaviours in class then that will help you to make a sound analysis. One of the first things you need to establish is can your child handle the material. Students can be experiencing difficulties with the level of the material and not tell you or the teacher. They feel vulnerable and afraid to admit to something they may see as a fault or weakness. You will need to do a little detective work: talk with your child and ask her what the problem is; phone the teacher and get her perspective; is it one subject or more? If you discover that your child is experiencing difficulties with a particular subject at school then you need to arrange a meeting with the teacher. Ask the teacher to summarize what, in their opinion, is the problem your child is having and how to fix it. Together you should come up with a plan to remedy the situation. A tutor may also help to give your child the extra help she needs to get a solid grip of the material. If you discover that your child is having difficulty with more than one subject, you could have the school assess your child. Is your child just forgetful? For some kids, getting homework to and from school is a difficult task. Sometimes getting them into good habits and a bit more of a routine can help with this. First thing you can do is simply ensure your child has a homework book and that the teacher checks it each afternoon before dismissal after your child has written down his homework assignments. Tell your child to ensure that after the teacher check, he has placed, in his backpack, all the texts and exercise books he needs to complete the homework. At home, when all the homework is done, tell your child he cannot do anything until he has placed the homework book and all texts and exercise books back in his back pack and it’s by the door. Stay on top of this consistently until your child does it without having to be reminded. 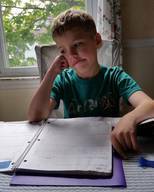 Is your child trying to complete their homework too quickly? Sloppy, untidy work is not accepted by teachers and (most) parents. It is usually a clear indication that the creator has rushed and has little if any pride in his work. If teachers and parents insist on an ‘acceptable level’ of neatness and quality, and insist it be redone until it is acceptable, it will soon become obvious to the speedy producer, that doing it right once is much quicker than having to redo the assignment two or three times. 1. Monitoring the child’s homework at regular intervals (yes, dad, you have to do something!). 2. Create check points e.g. : 30 Math examples – “Come to see me after completing ten.” (this is where you check the neatness and quality). 3. Establish a homework time block with a set amount of time. If child completes all homework before the time is up, they must read until the time is up (this slows down the child rushing to move on to a more enjoyable activity). 4. Of course TV, video games, internet, cell phones, devices, etc., etc. are totally out of the picture until homework time is done. Is your kid resisting their homework? Children who resist doing homework are usually indicating that there is something else going on – as the parent who’s there to help and support them where you can, it’s your job is to find out what it is. Talk with your child to see if you can determine what is going on. Has something changed at home or at school? Are they upset about anything? Use your skills at ‘20 Questions’ to try and elicit what is going on in their mind that prevents them from being able to start and complete homework. Try to determine if the reason for the struggle is due to their understanding of the material – do they find it hard? Is it an attention problem – do they find it hard to concentrate for more than a few minutes? Do they feel lost? Do they need extra help? If you are lucky enough or not to discover what the problem may be, your next step is to contact the teacher and ask to meet. When you meet with the teacher try to come to a consensus as to what is causing your child’s resistance to homework and what steps can be taken to resolve the problem. Working hand-in-hand with your child’s teacher is usually the best and fastest way to get positive results. Again, remember: any plan devised to help your child must be followed through by you – because no plan, no matter how good, will fail without consistent parent support. For help encouraging your child to do homework or determining if there are any problems, please contact the expert contributor.